Dr Zarir Udwadiahas over 130 PubMed indexed publications and over 7000 citations to his credit and is co-author of "Principles of Respiratory medicine" published (2011) by Oxford International. New Delhi: About 8,000 patients pass through Dr Zarir F Udwadia’s busy clinic every year. The patients who are usually referred to him by colleagues from different parts of the country are difficult cases of multi-drug resistant tuberculosis (MDR-TB). 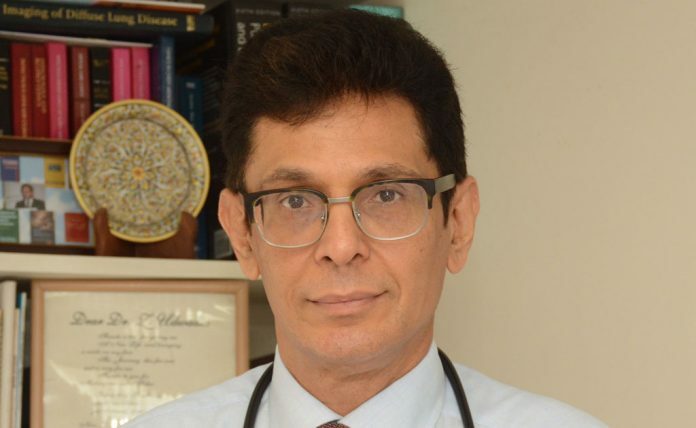 An expert in drug-resistant tuberculosis and interstitial lung disease (ILD), Dr Udwadia is currently a chest physician at Mumbai’s Hinduja Hospital. In a medical career spanning 25 years, the 55-year-old doctor became an expert voice who, in 2016, was invited to give a TED talk on Drug Resistant Tuberculosis- ‘India’s Ticking Time Bomb’ at the TED conference. He is also the only Indian to be a part of the group that formulated the TB Guidelines, published by WHO in 2010. Q. What’s the most startling fact about Tuberculosis (TB) in India? A. The fact that despite one Indian dying of TB every minute and despite the disease costing the country US $24 billion a year, the Indian government chose to cut the TB budget by 20 per cent this year. That’s three inter-related facts: but this huge discrepancy between ground reality and implementation is truly staggering. Q. TB continues to be perceived as a disease of poverty. How do we address this issue? A. The TB bacillus does not respect a person’s bank balance or social status. Thus, though poverty, malnutrition and over-crowding are traditional drivers of TB, as the epidemic spreads, no one is immune. This is, after all, an air-borne disease with millions of infectious droplets released each time an infected patients coughs. Q. In your recent TED Talk, you spoke about the need to focus on issues like poor diagnostics and access to treatment. How widespread do you think these issues are in India’s TB crisis? A. The Indian program continues to rely on outdated sputum smear tests that will consistently miss 50 per cent of cases. To do so, when there are newer genetic tests like the Gene Xpert available, is like hoping to win a Grand Prix race whilst driving a bullock cart. Q. The government has decided to expand the access to the TB drug Bedaquiline. How can we ensure it reaches the ones in need? A. You know this is a life-saving drug for so many XDR-TB patients. To control the drug so tightly when lives are at stake is shocking. That a desperate patient needs to take the extreme step of taking the government to court when they are sitting on vast stocks of the drug is unconscionable. Q. You have consistently spoken out about TB epidemic in India. Your documentation of the first TDR patients led to change in policy. What are other key areas where policy must change for India to fight TB more effectively? A. Our reports of the first Indian patients with Totally Drug Resistant TB (TDR-TB) shook the authorities from their complacency and put this long-neglected disease on the radar. What is needed has always been clear: government commitment and funding, rolling out of the newer generation of diagnostic tests which can diagnose TB more rapidly and accurately, and the provision of appropriate TB drugs to all patients irrespective of their pattern of resistance. Till we do this, the much-vaunted talk of eliminating TB by 2025 will remain just that – an empty talk. Q. Your thoughts on the current Revised National Tuberculosis Control Program (RNTCP) by the government and its implementation. A. The current RNTCP program is certainly a vastly improved version of the older one and the recent switch to daily therapy instead of the intermittent treatment, initially offered, is a step in the right direction. It’s still a program operating at a low level of efficiency and a sense of urgency is lacking.